Brought to you as a public service by RVtravel.com. Support comes from our sponsors, advertisers and the contributions of readers, who believe that an educated RVer is a safe, happy RVer. Subscribe to one of our many online newsletters (including this one) about RVing. Here’s an update on the RVelectricityTM seminars that I presented in 2018, and where I’m going in 2019/2020. Now, I’m a seasoned seminar instructor with more than 1,000 classes presented during the last 25 years, but those were primarily on “uninteresting” topics like mixing DTS and Dolby 5.1 surround sound for movies, concert sound system calibration and setup, and mixing music in large churches around the country. I’ve even done a few dozen No~Shock~Zone seminars for the pro-sound and theater industries, since there’s a lot of live wires involved in both. But 2018 was the first time I’ve done any formal RVelectricityTM seminars for the RV industry, and I’m happy to say they’ve had rave reviews. I think one of the reasons these RVelectricityTM seminars are such a big hit is that I do a lot of hands-on demonstrations. Do you want to see how to detect a hot-skin/stray-voltage? Well, I bring along a scale model of a VW RV and energize it with up to 120 volts AC. Want to know how to properly measure a pedestal voltage? I not only bring along a real 50/30/20-amp pedestal, I also connect it to a 3 KVA 120/240-volt step-up transformer (that weighs nearly 40 lbs.) to create an actual 50-amp/240-volt electrical service just like you’ll see in any campground. 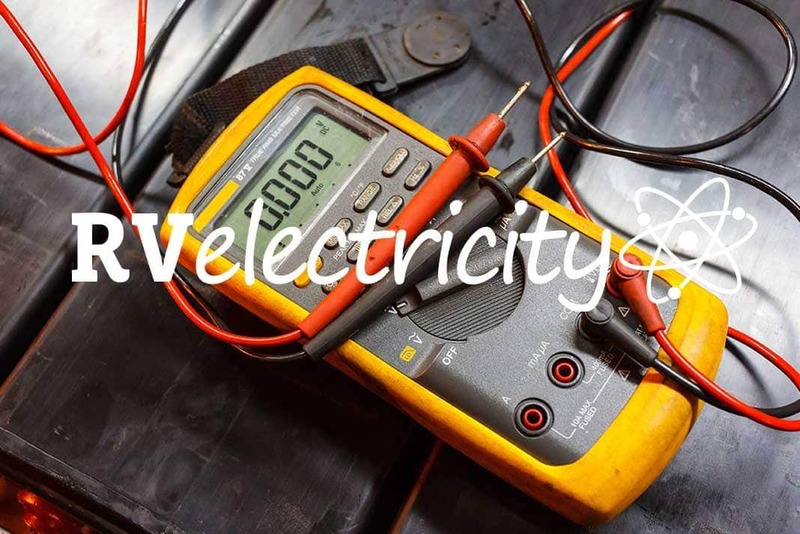 Want to learn how to use voltmeters and Non-Contact Voltage Testers? Well, I bring along samples of nearly every type of meter and tester you’ll likely encounter and demonstrate how they work using an overhead video camera which shows up on a video screen. Want to know how surge-protectors work? I connect a few of them to a variable AC power supply so you can watch how they detect high and low voltages, open grounds, etc. In short, I bring along an entire electrical test bench and let you watch me do these electrical demonstrations in real time on a big screen while I answer questions. Want to attend one of these fun and informative hands-on demonstrations? Then see below for a list of RVelectricityTM seminars I’ll be presenting in 2019 and possibly 2020. And if you have an idea for a seminar topic you might like (in addition to those I’ve listed in the Poll, below), then please comment at the bottom of the page and I’ll see what I can come up with. P.S. And just a quick note that this newsletter is made possible by the voluntary pledges of the readers of RVtravel.com. We could not bring this to you without their support. If you deem what we provide to you here and at RVtravel.com to be of special value and would like to be a part of our effort, please consider pledging a voluntary subscription. More information is here. We will include you in special emails, articles and videos exclusively for our supporters. Heat your RV with Electricity, not Propane! SAVE $$$! Until now, the standard for heating recreation vehicles of all types has been to use bottled propane (LPG). With the CheapHeat™ system there’s a better option. Now you have a choice to change the central heating system between gas and electric with the flip of a switch. When you choose to run on electric heat rather than gas, your coach will be heated by the electricity provided by the RV park. Learn more. Ground sounds like such a simple and friendly word. But here’s what it actually means and how it’s often misused by electricians, technicians and the public at large. It ain’t what you think…. Email me at mike (at) noshockzone.org with your questions. Here’s your chance to let me know what I should be teaching in my RVelectricity seminars for 2019. I already have three 60-minute seminars in the can, and I can add at least one more topic. So please pick your TWO favorites out of those listed, and feel free to suggest an additional topic in the comments. Of course, if I had my druthers I’d teach all these seminars each time. But I’m usually limited to one or two topics per show or rally. Here’s where I presented RVelectricityTM seminars in 2018. Scroll down below for a list of seminars scheduled for 2019. These are 60-90-minute hands-on demonstrations covering every aspect of RV electrical hookups and safety. I’ve noticed that the majority of attendees in my RVelectricity seminars don’t carry any kind of digital multi-meter with them. Well, having a good meter with you is the best way to diagnose all kinds of electrical problems on the road. Not only can it tell you pedestal AC voltage, you can use it to check DC voltage on your house batteries. It’s also great for testing bulbs and fuses for continuity, or to figure out why your ceiling fan isn’t working. So what’s better than a digital meter? Well, how about a digital meter kit from Southwire that also includes a Non-Contact Voltage Tester (NCVT) as well as a basic 3-Light Outlet Tester. At about $30 this kit is affordable for everyone with an RV, and it will help you utilize all the electrical diagnostic tips and tricks you’re learning from my articles, videos and seminars. 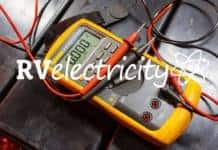 Don’t guess about a voltage, MEASURE IT!!! • Use 50-amp to 30-amp adapter in a pinch? • What residential refrigerator do you have? • Campground power upgrade – expensive but necessary. • Start me up … Generators and rooftop air conditioners. Q: I have a 2019 Georgetown Forest River 36B5GT5. I just plugged into an electrical outlet for the first time and I’m plugged to a 15-watt amp using a converter. When I pulled in last weekend after running my generator, I turned the generator off and plugged in and heard everything come back on. When I went to check on it yesterday, the microwave was off and refrigerator was beeping at me. Is there something I’m not doing when I switch to electrical? Thanks in advance. A: I think your confusion is due to a lack of understanding of the difference between amps, volts and watts. What I really think you mean is you’re plugging your RV into a 20 “amp” pedestal outlet using a “dog-bone” adapter. The best book on RV electricity, hands down! If you have a 30-amp shore power plug on your RV you can use a dog-bone adapter to plug it into a 50-amp pedestal outlet if that’s the only thing available. However, you won’t get any more power out of it since your RV’s electrical system is limited to 30 amperes of current. And you certainly don’t want to be pulling 50-amps through a shore power cord that’s only rated for 30 amps. Best to eliminate all adapters if possible and plug into the proper 30-amp outlet to begin with. See Gary Bunzer, The RV Doctor’s, article on this topic here. Yes, I’ll be back. If you missed my RVelectricity seminars in 2018, I’m gearing up for even more fun electrical demonstrations in 2019. So, as they say, “Coming to a rally or show near you.” I have time to do perhaps a dozen of these larger shows next year, but I’m only halfway there. So if you’re involved in one and think I should be presenting an RVelectricity seminar there, please leave a comment below or email me directly at mike@noshockzone.org . Editor: Mike Sokol. RVtravel.com publisher: Chuck Woodbury. Managing editor: Diane McGovern. Everything in this newsletter is true to the best of our knowledge. But we may occasionally get something wrong. So always double check with your own technician, electrician or other professional first before undertaking projects that could involve danger if not done properly. Tips and/or comments in this newsletter are those of the authors and may not reflect the views of RVtravel.com..
Mail us at 9792 Edmonds Way, #265, Edmonds, WA 98020. This newsletter is copyright 2018 by RVtravel.com. RV Electricity – Just Ask Mike (J.A.M. ): Disconnect power during a storm? RV Electricity – Can an RV be plugged into a Tesla charging station? RV Electricity – Just Ask Mike (J.A.M. ): Surge Protectors for 30- or 50-amp power? Technician Training (or lack thereof)? Road Signs # 17 – You are what you eat! RV Electricity – Just Ask Mike (J.A.M. ): Should I turn off circuit breakers? RV Electricity – Why did my shore power plug neutral burn up? Mike – Topic suggestion – best way to check pedestal receptacle retention force for acceptable use and what to do if it’s too loose, outside of site hopping. Seems many are marginal just by feel; a loose connection is a bad connection as you know. May I suggest that you describe different types of wires and cables that would be safe to use in an RV solar system or for wiring new lighting as a mod. For example I have recently learned about marine duplex cables. What gauge would be correct for various solar controllers or long runs in an RV? I enjoy reading your newsletters to learn more about RV electric. Yes, I’m working on the whole enchilada, as it were. Now, did I spell enchilada correctly, Diane? Mike would you ever video one of your RVelectricity seminars so people could see it when we can not get to a rally where you are at? Chuck and I are talking about it, and we’ll do a few experiments at my various seminars in 2019. How do we sign up for the Quartzsite seminar? Bob, we’ll have information in the RV Travel Newsletter within a couple of weeks. I’m sure Chuck will come up with some sort of sign-up form. why so many different kinds and styles of plugs? aka: home dryer, rv, and twist lock, to name three. but my rv has a different style 30 amp plug. (not sure of rating, believe 30 amp) the dryer has a third style plug. i understand a twist lock to to help keep the ex cords from pulling apart. Great reminder. I go over that during my hands-on seminar about Pedestal Testing and Hookups, but once I get out from under some of my other projects I’ll make a video on pedestal connections. Those are the same gloveless people who rinse out their sewer hoses with their fresh water hose, and let the sewer hose dry on the campground table.